Create many outfits with just a few pieces! Meet your perfect matches on your My Recommendations page! This is where we can become your Wardrobe Wingbirds! Fill in your Style Profile to receive exclusive, personalised Style Recommendations and your very own birdsnest Style Guide! Fill in our online questionnaire to tell us about your shape, your personality, the colours you like to wear, occasions you like to dress for, and much more! 146 other birds have this item in their bag or wishlist! 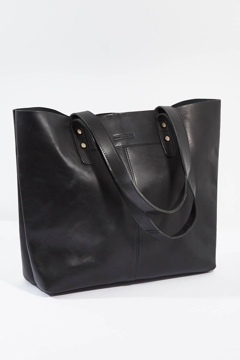 The Emma Tote from Stitch and Hide is a fashionable and versatile leather tote! We deliver our orders to you via the Australia Post express post network. If orders are received before 1pm EST on a business day we aim to have the order to you within 2 working days. Delivery is free on all orders over $150 Australia wide. When your order is less than $150, we will express post your order for a flat rate of $7.95. For more details and international rates visit Our Delivery Guarantee. We pride ourselves on a no hassle returns policy. If it doesn't fit or suit - please return the item within 365 days for a full refund, credit or exchange. Our pre-paid return option within Australia is $7.95 flat rate, and free the first time you use it. For more details visit Our Returns Guarantee. Yes, I would recommend this item. 0 found this review helpful, 0 did not. Our autumn magazine is out now! Your new season inspiration awaits! The stories that bring you behind the scenes, inspire your personal style, make you laugh, and occasionally make you cry - your place for all things birdsnest. The birdsnest girls like to think of themselves as your wardrobe wingbirds! Our mission is to solve women’s wardrobe dilemmas by providing personalised styling advice, express delivery, styled outfit inspiration, above-and-beyond customer service, no hassle returns and a vast range of brands and sizes for all body shapes, both online and in-store. We want you to find and LOVE your own style. Our little Nest is based in the Snowy Mountains town of Cooma, NSW where our family owned business now employs around 140 local birds! © Copyright birdsnest.com.au 2019. All rights reserved. How likely are you to recommend Birdsnest to a friend? There is a chance it could come back into stock. Some items will be reordered, or it may fly back into our nest as a return. Please fill in your details below, so we can let you know by email if it comes back into stock. Fingers crossed. Optional: you can make a note of why you picked this as a winner. To help you review your wishlist, you can make a note of why you picked this as a winner. Please enter your first name so we know this item is for you. Watch out for it on the "Arrivals" screen.